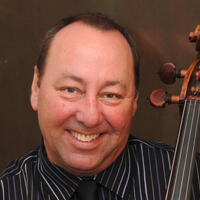 Cellist Peter Wiley enjoys a prolific career as a performer and teacher. He is a member of the piano quartet OPUS ONE, a group he co-founded in 1998 with pianist Anne-Marie McDermott, violinist Ida Kavafian, and violist Steven Tenenbom. Mr. Wiley attended the Curtis Institute of Music as a student of David Soyer. He joined the Pittsburgh Symphony in 1974. The following year he was appointed principal cellist of the Cincinnati Symphony Orchestra, a position he held for eight years. From 1987 through 1998 Mr. Wiley was a cellist of the Beaux Arts Trio. In 2001 he succeeded his mentor David Soyer as cellist of the Guarneri Quartet. The Quartet retired from the concert stage in 2009. He has been awarded an Avery Fischer Career Grant, nominated for a Grammy Award in 1998 with the Beaux Arts Trio, and in 2009 with the Guarneri Quartet. Mr. Wiley participates at leading festivals, including Music from Angel Fire, Chamber Music Northwest, OK Mozart, Santa Fe Chamber Music Festival, Bravo!, and Bridgehampton. He continues his long association with the Marlboro Music Festival, dating back to 1971. Mr. Wiley teaches at the Curtis Institute of Music and the Bard College Conservatory of Music.